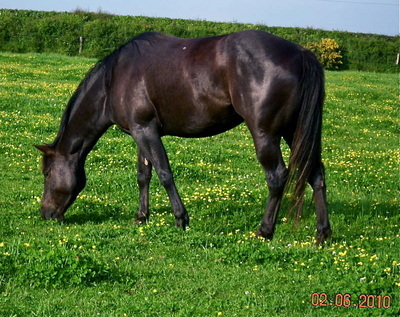 Lonesome Dove Quarter Horse Breeders, Wales - "Black Chestnut"
As of this writing, "Black Chestnut" is a description, rather than an official, recognized color. This is because the color has not yet been genetically mapped. The horse above is a RED based horse. This is evidenced, primarily, by her color at birth (photo four in the expandable gallery above, click to expand gallery). 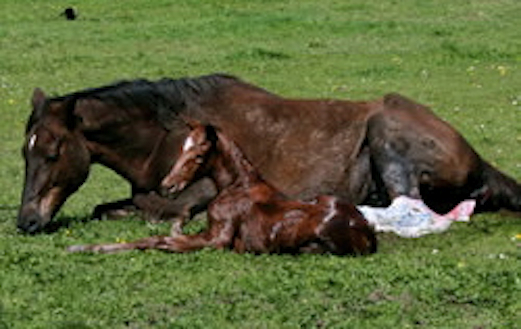 All red horses (called sorrels, or chestnuts) are genetically "ee" (E-series recessive) - which means they essentially test negative for black hairs. The presence of black hairs is written (expressed) as "E" or "EE"
Each horse has TWO E-series alleles (place holders) - one is received from each parent. Every horse is/has one of these three E-series patterns. Here are their meanings. 2. Ee - heterozygous for the black gene (one black gene); when the black gene is present, it is always expressed (shows up on the horse) because E is dominant. 3. ee - negative for the black gene. 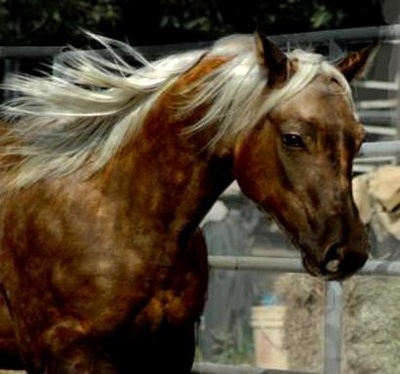 No black hairs should appear on the animal. 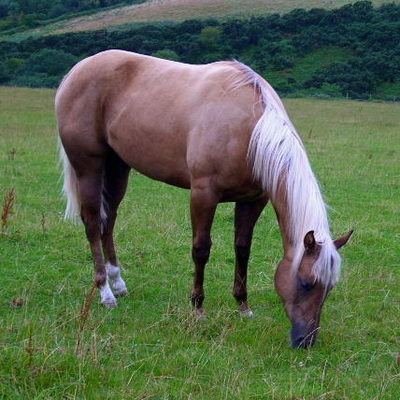 According to the American Quarter Horse Association (AQHA), a SORREL is a red horse with a red and/or flaxen mane/tail. A CHESTNUT horse is a brown horse, with a brown and/or black mane/tail. So you see, we have a conundrum. 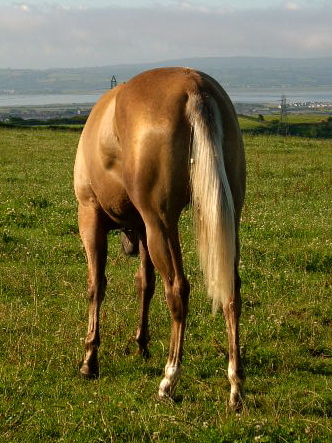 How can a chestnut horse have a black mane/tail if it is genetically "ee"? The answer to this question is that we don't know yet. Clearly there is some other mechanism which is causing black to appear on the horse, where it should not be, according to our current theories. 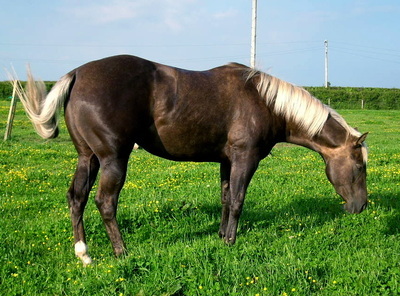 The Black Chestnut takes this problem to a whole other level - not only does this chestnut have black hairs in the mane and tail (or a completely black mane and tail) but the body coat is full of black hairs as well. Again - two alleles (one from each parent). In the following examples, we will assume the second allele is "a" (negative Agouti), for simplicity's sake. 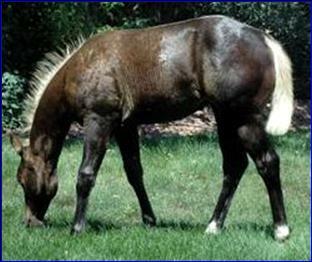 At/a - Black & Tan (mistakenly called Brown) which is a pattern of black hairs spread over the neck, shoulders and rump, in addition to the mane/tail and stockings. 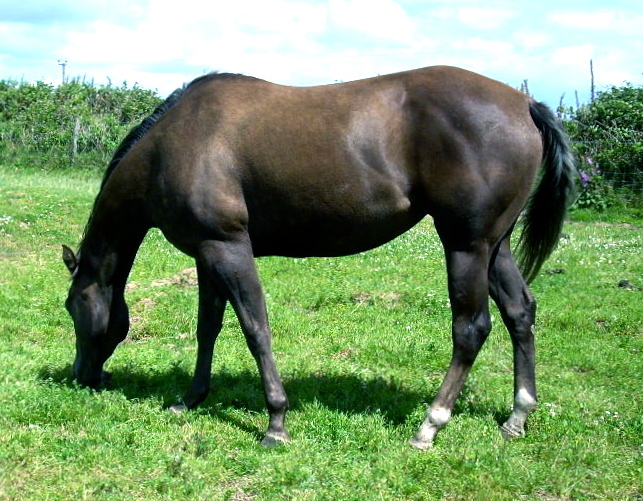 It is usual for a Black & Tan horse to have a tan colored muzzle, and lighter areas at the "soft points" on his flanks. Animal genetics in Arizona is the only lab testing for At, and there is some suggestion that SEAL brown (where each individual hair is actually BROWN, not black), is included in the At test. This seems unlikely to me. If SEAL were included in Agouti function, then I would expect to see an As test, which there is none. Sponenberg (an early equine geneticist) ruled out the presence of bb in horses, which is true BROWN in other species. 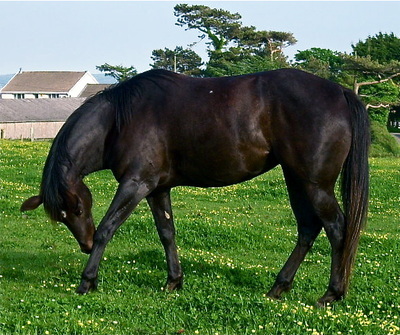 As a result of Sponenberg's findings, it is commonly assumed that all horses are BB (black). I remain unconvinced, because it is virtually impossible to prove an impossibility. 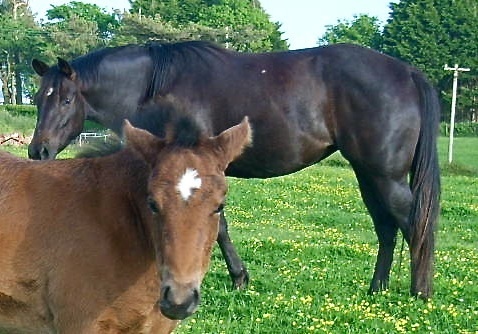 Another possibility is the presence of Dominant Black 'ED' - which is also said not to exist in horses - yet I know personally of a black Welsh Cob stallion who is producing black foals to every single mare - including bays. This should not be possible with the E/A series - and argues strongly that the horse must be ED (E-dominant). ... but in the meantime, here is an interesting gallery of photos showing what can happen when a black chestnut gets the cream (palomino) gene. Black hairs (unlike red ones) are not properly diluted by the cream gene - so here's what can happen. I can't explain it - but these photos are all of the same horse! !